Arthur Conan Doyle's legendary literary sleuth, Sherlock Holmes, has made something of a comeback in recent years (if he's ever been away, that is). With a couple of Hollywood blockbusters starring Robert Downey Jr. and the award-winning BBC series featuring Benedict Cumberbatch as the Victorian genius detective, interest in Sherlock is not going anywhere anytime soon. 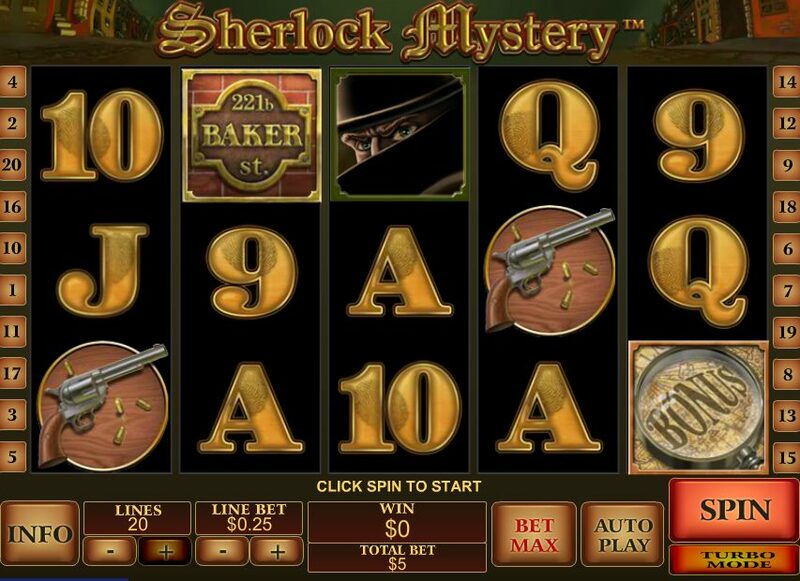 Slots developers are obviously keen to tap into the current obsession with all things Sherlock, it seems, if Playtech's latest online slot - Sherlock Mystery - is anything to go by. A 5-reel, 20-payline slot, Sherlock Mystery makes up in gameplay what it lacks in RTP (a paltry 94%), with two potentially juicy bonus rounds. In terms of symbols on the reels, we get Sherlock and his best friend, John Watson, themselves, plus a magnifying glass, a knife and a gun, a 221b Baker Street sign, plus and some generic 9-to-Ace icons. Sherlock and Dr. Watson always made an explosive pairing, and they make one that is just as explosive on the reels if they meet. Land Watson to the right of Sherlock anywhere on the reels and you'll earn a prize worth 3x your total bet. Sherlock's arch-nemesis, Professor Moriarty, makes a welcome appearance too. He acts as the game's Wild and substitutes for all regular symbols in the game other than the Scatter and Bonus symbols. Hit five Wilds and you'll bag a lovely 10,000-coin jackpot. Can You Spot the Crime Scene Bonus? Hit three magnifying glasses on Reels 1, 3 and 5 and you'll trigger the Crime Scene Bonus. Use Sherlock's keen eye and nose for hunting out clues by selecting pieces of evidence. Each one will reveal a different cash prize; keep picking until you hit the 'Collect' sign and go spinning back to the main game. 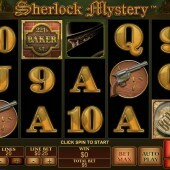 Free spins sleuths are not left scrabbling around for evidence - it's right there on the reels in the form of the Baker Street signs (the home of Mr. Holmes himself). Three or more of those anywhere on the reels bags you 10 free spins, with the revolver icon becoming an Extra Wild during spins. If the Wild is used towards any wins you'll bag a random multiplier of 2x, 3x or 5x. The spins are re-triggerable, and potentially you can keep on winning more and more spins ad infinitum. On the face of it, Sherlock Mystery doesn't have that much mystery about it: its bonuses are simple but the Gothic literature style illustrations lend themselves to the atmosphere. Personally, I prefer the Cluedo-inspired Mystery at the Mansion from NetEnt or Betsoft Gaming's great 3D mystery-themed Whospunit slot; both are a little more involved in terms of the mystery angle.